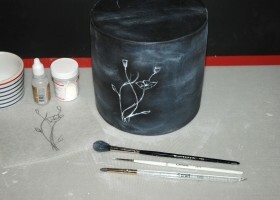 How to Create a Chalkboard Effect Cake! Over the past few months we have noticed more and more of the "chalkboard effect" being featured on many beautiful cake designs. However, we were drawn to one chalkboard cake in particular, which was created by the super talented Simona from Sweet Rocket Queen. 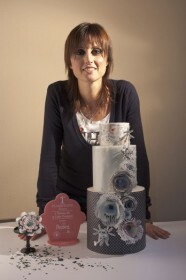 I'm sure you will all agree, her cake above is an absolute show stopper! 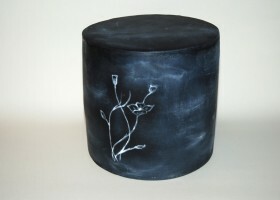 So we thought, who would be better than Simona to put together a blog about creating a chalkboard effect cake?! 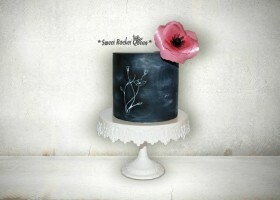 The first time I saw the chalkboard effect was on Pinterest, and not on a cake! I fell in love with the erased look and I was waiting for the occasion to feature it on a cake. Did this ever happen to anyone else; to see something and immediately start thinking : "I see a cake! I see a cake!?" That’s what happened to me! 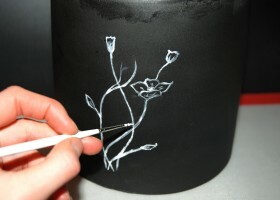 Then I saw this technique on a cake on Cakes Decor. 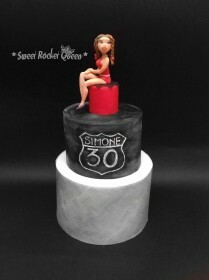 I don’t remember the name of the cake designer, but it was the first time I saw it on a cake and ….oh my! It was so cool! Now you can see many cakes created with this technique: it’s an up and coming trend! I love to combine this technique with something colourful, to accentuate the dark colours. 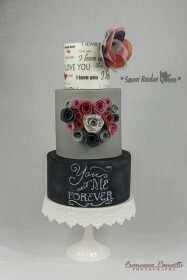 Here is one of my cakes where I combined white and red with the chalkboard effect, to make the colours stand out. If you would like to obtain this effect, then follow these tips below! 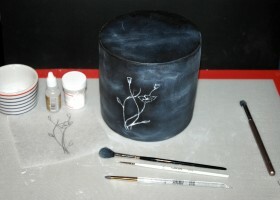 Stage 1 : To create the “chalkboard effect” you need a cake/cookie covered with black fondant and an image to reproduce. I find my inspiration for images on Pinterest and on the web. 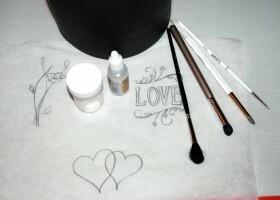 Don’t worry if you are not a good painter, you can sketch an image onto oven paper or even use a stencil. 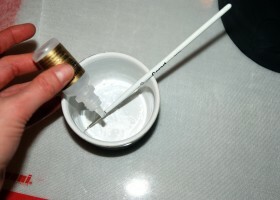 You also need some brushes, a silicon shaper (or anything else to mark the fondant), white dust food colour and a clear spirit (vodka). 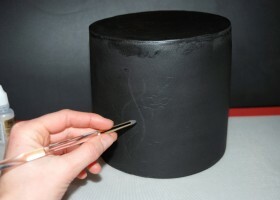 Stage 2: Lay the oven paper onto your cake and draw the design, by gently pressing your tool into the fondant. 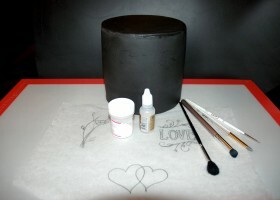 Stage 3: Make sure you can see all the parts of the drawing on your fondant like the photograph above. Stage 4: Mix the alcohol with the white dust. 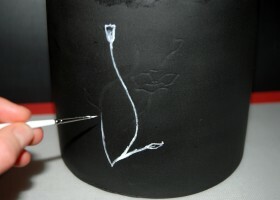 Stage 5: Along the lines previously plotted, gently sketch the drawing with a very fine brush. 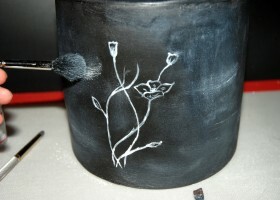 Stage 6: Take a small amount of white dust with the large and soft paint brush. 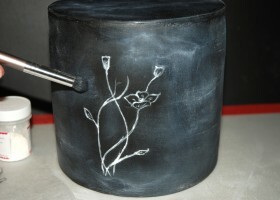 Stage 7: To get the "erased" chalkboard look, brush the cake very lightly with the large and soft paint brush. The more you do it, the more you have the “erased" look. 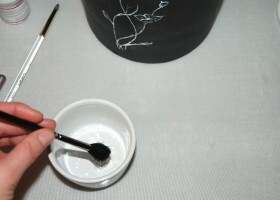 Stage 8: When you are satisfied with it, you can use a hard bristle brush to standardise the colour. 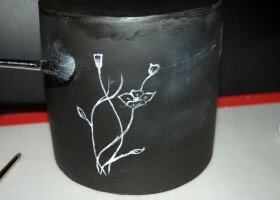 Stage 9: Here it is: your own chalkboard effect! Thank you very much to Sweet Rocket Queen for her fantastic and easy to follow step-by-step demonstration! If you feel brave enough to give the "chalkboard effect" a go, then make sure to post your photographs to our Facebook page. What is bas-relief & how can you create it with your cakes?